November 6. 2014, International Conference on Disaster for Citizens in Hachinohe 2014 was held at Hachinohe Institute of Technology, HIT, Japan. The purpose of this conference is to provide a new research knowledge on disaster prevention in the area of citizen. The conference has been implemented every year since huge earthquake and tsunami of 2011 in order to raise awareness of disaster prevention. Hachinohe was also one of huge damaged area by 2011 earthquake and Tsunami. This International event was opening by Prof. Shigetaka Fujita –Director of Hachinohe Institute of Technology Research Center for Technology in Disaster Reduction and Construction of Social System, Hachinohe Institute of Technology and President of Hachinohe Institute of Technology. This time, the lecture on geotechnical engineering in natural disaster was made to center. For this conference two professors have been invited from abroad. 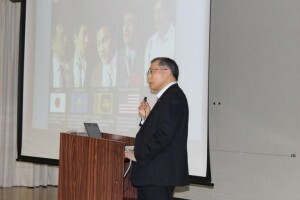 The first invited lecturer was Prof. Askar Zhussupbekov, Eurasian National University, Kazakhstan, who is the Immediate Past Vice-President of ISSMGE for Asia. 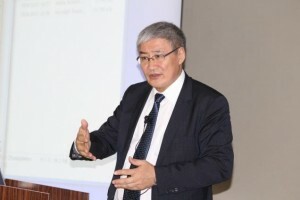 His lecture title was “Natural and man-made geohazards in Kazakhstan”, he explained a few kinds of geohazards made by natural and human in Kazakhstan. 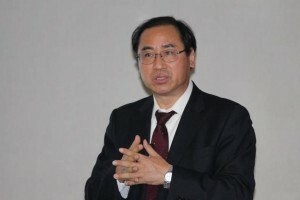 The second lecturer was Prof. EunChul Shin, Dean of Urban Science College, Incheon National University, Korea, a member of ISSMGE. His lecture title was “Disaster of Korea – Design and Construction of Geotextile Tubes for Sea Dikes along Costal Line”. He explained the method and worldwide applications on Geotextile Tubes.